We’ve got yet another birthday to celebrate today, that of the great trumpeter Bubber Miley. Miley was a excellent player noted for his use of the plunger mute. Duke Ellington’s Washintonians with Bubber Miley (second from right). From Jazzmen, 1939. James Wesley Miley was born April 3, 1903 in Aiken, South Carolina, and moved to New York City at the age of six. After serving in the Navy, Miley formed a jazz band called the Carolina Five (much in the vein of the Memphis Five or the Indiana Five, except that Miley actually was from Carolina), and played around New York and Chicago. In Chicago, Miley was inspired by the muted trumpet of King Oliver, and developed his own muted style of playing. 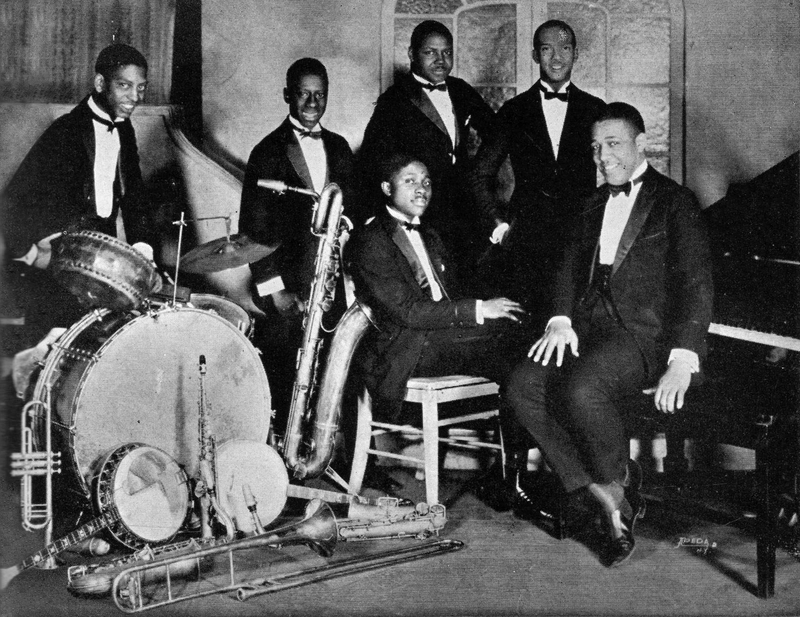 In 1923, he joined Elmer Snowden’s Washingtonians, of which leadership was soon assumed by the band’s pianist, Duke Ellington, after a monetary dispute. Miley, along with trombone player “Tricky Sam” Nanton, are credited for developing the band’s “jungle sound”. Bubber remained with Ellington’s band until 1929, when his alcohol issues and general unreliability led to his replacement by Cootie Williams. After leaving Ellington, Miley toured Paris in Noble Sissle’s band, and once back home played with Leo Reisman’s dance band, and a number of jazz groups (possibly including King Oliver’s Victor orchestra). In 1930, he fronted a band billed as “Bubber Miley and his Mileage Makers” for three sessions with Victor. Much like his contemporary, Bix Beiderbecke, Miley saw a decline in his health in the early 1930s, and died of tuberculosis at New York’s Welfare Island on May 20, 1932. He was remembered by former band-mates as a joyful and carefree character. Brunswick 3526 was recorded in two sessions in 1927, the first on April 7 and the second on April 30 in New York. The band’s personnel features Bubber Miley on the first side, June Clark on the second, and Louis Metcalf on trumpet, Joe” Tricky Sam” Nanton on trombone, Edgar Sampson on alto sax, Otto Hardwicke on clarinet, soprano sax, alto sax, baritone sax, and bass sax, and another unknown reed man, Duke Ellington on piano, Fred Guy on banjo, Mack Shaw on tuba, and Sonny Greer on drums. Duke and his band recorded his famous “Black and Tan Fantasy” quite a number of times, this is the first one, and one of only two, I believe, that feature the distinctive muted trumpet of the song’s co-writer, Bubber Miley. I would also recommend a look at Ellington’s 1929 motion picture of the same name. 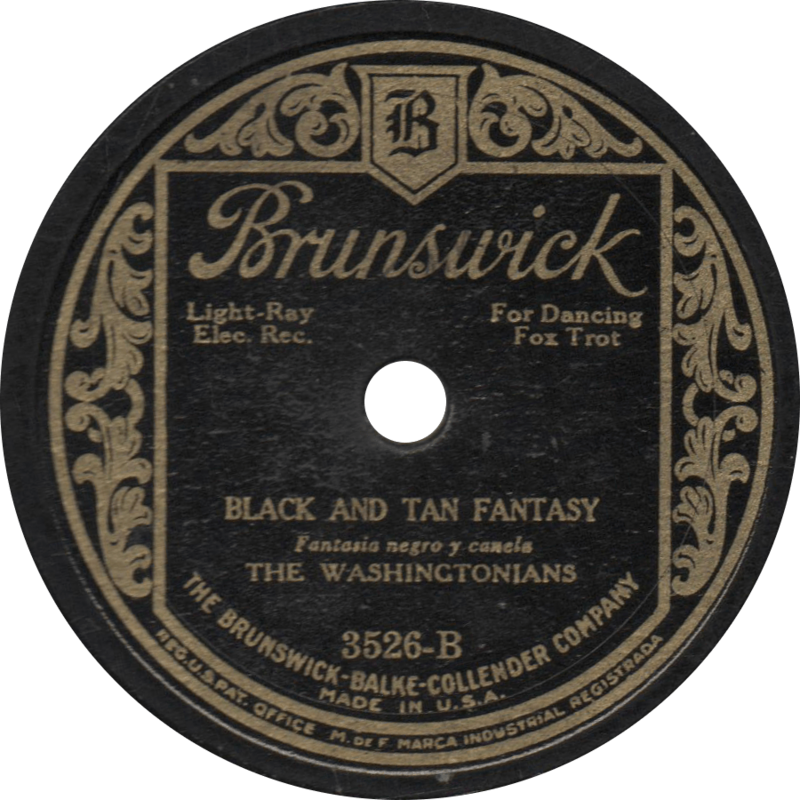 Black and Tan Fantasy, recorded April 7, 1927 by the Washingtonians. Bubber doesn’t play on the other side of the record, which contains an excellent rendition of Rube Bloom’s “Soliloquy”. 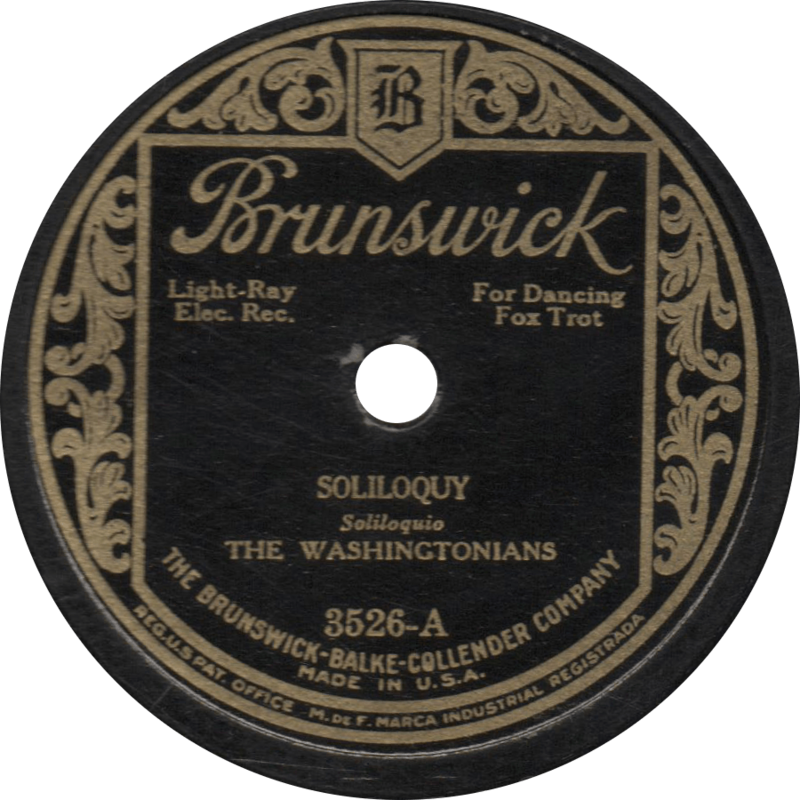 Soliloquy, recorded April 30, 1927 by the Washingtonians. In celebration of fifty “likes” on our Facebook page, we’ll have a jubilee here at Old Time Blues, and what better way to than with the hot jazz of Duke Ellington’s Cotton Club Orchestra on two of their hottest for Victor records. Bluebird B-6415 was recorded on two separate occasions, the first side on March 26, 1928 and the second on December 19, 1927, both in New York City. The “A” side was originally issued on Victor 21580 and “B” on Victor 21490 and again on 22985. Given the two record dates, the two sides feature different personnel in the band. The first includes Arthur Whetsel, Bubber Miley, and Louis Metcalf in the trumpet section, “Tricky Sam” Nanton on trombone, Barney Bigard on clarinet and tenor sax, Otto Hardwicke on clarinet, soprano sax, alto sax, baritone sax, and bass sax, Harry Carney on clarinet, soprano sax, alto sax, and baritone sax, Duke Ellington on piano, Fred Guy on banjo, Wellman Braud on string bass, and Sonny Greer on drums. The second features Miley and Metcalf on trumpets, Tricky Sam on trombone, Rudy Jackson on clarinet and alto sax, Otto Hardwicke and Harry Carney on all the same reeds as the first side, and Ellington, Guy, Braud, and Greer in the same positions as the previous. One of Ellington’s best, “Jubilee Stomp” was played in 2011’s The Artist, albeit on a disgustingly inaccurate phonograph. 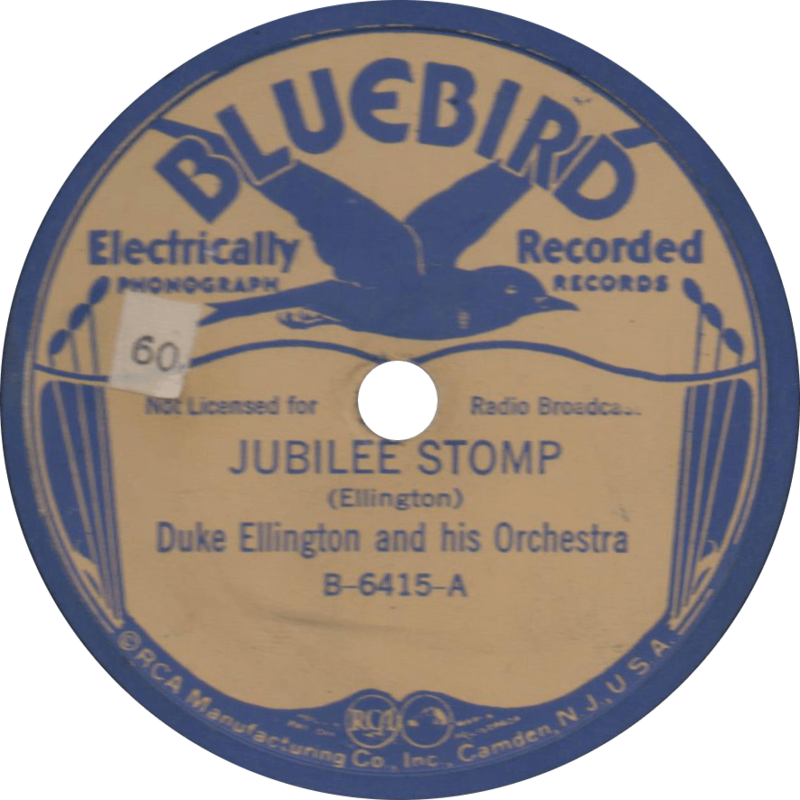 Jubilee Stomp, recorded March 26, 1928 by Duke Ellington and his Orchestra. On “Blue Bubbles”, Ellington shares composer credit with Bubber Miley, and the piece bares some stylistic resemblance to another of Miley’s works, “Black and Tan Fantasy”. 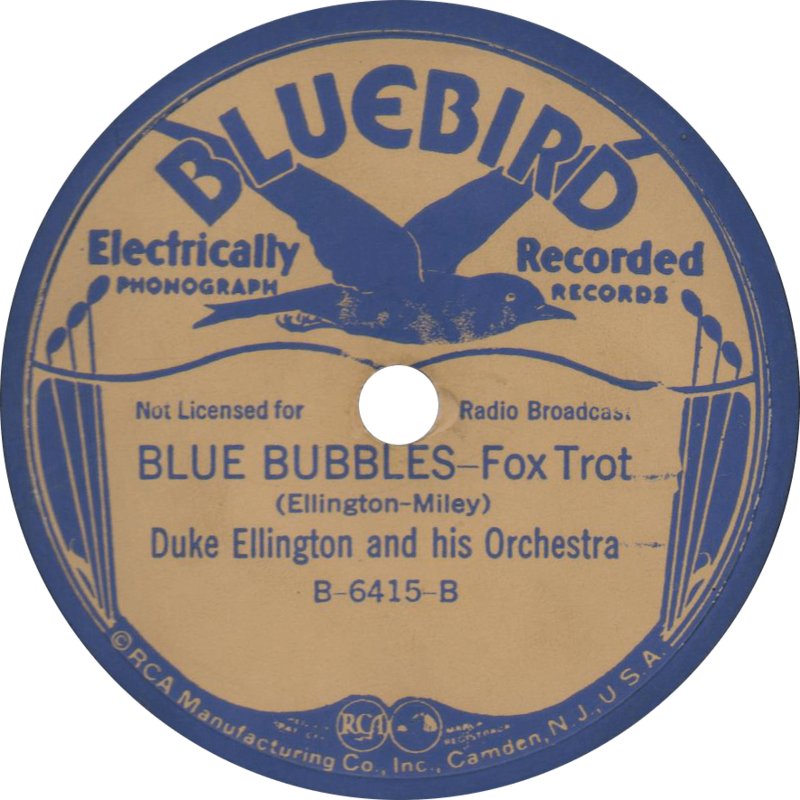 Blue Bubbles, recorded December 19, 1927 by Duke Ellington and his Orchestra. “Here’s a treat! Hot playing, hot singing, and rhythm that will make you squirm when you hear it,” is what Victor said of this record in their April 1930 supplemental catalog, “It’s one of the meanest, hottest, most irresistible dance records ever. It’s the kind that breaks down all inhibitions!” This was actually the first King Oliver record I ever owned. I got it by accidentally bidding more than I’d intended to in an online auction. In spite of that, I was thrilled to have such a great record in my clutches, and I still get a thrill thinking of this outstanding hot jazz record. Since it was my first, I think it’s fair for it to be the first King Oliver record uploaded here. By this late time in his career, King Joe was suffering from gum disease, and took far fewer solos on his trumpet than he did in years prior, and did not play on many of his Victor recordings at all. On this one however, Oliver does in fact play, though not a whole lot. 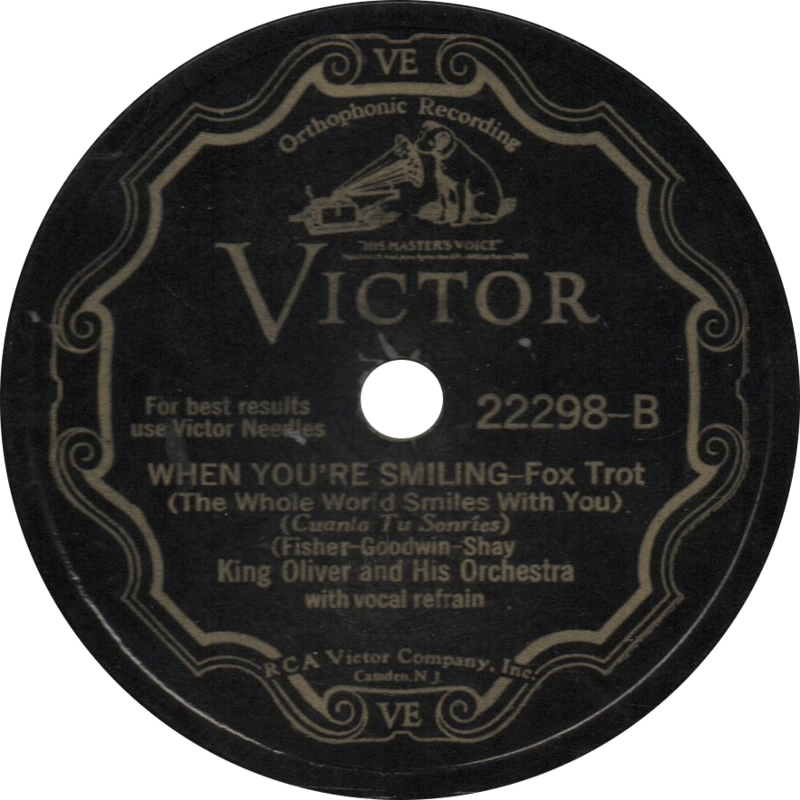 Victor 22298 was recorded January 28, 1930 at 28 West 44th Street in New York by King Oliver and his Orchestra. There seems to be some confusion as to the personnel, it features either Bubber Miley and Henry “Red” Allen, Jr. or Dave Nelson and Oliver on trumpet, Jimmy Archey on trombone, Bobby Holmes on clarinet and soprano sax, Glyn Paque and possibly Hilton Jefferson on clarinet and alto sax, Walter Wheeler on tenor sax, Carroll Dickerson on violin, Arthur Taylor on banjo, Jean Stultz on guitar, Clinton Walker on tuba, Don Frye or Hank Duncan on piano, and possibly Fred Moore on drums. Dickerson directed this session under Oliver’s name. Studio vocalist and occasional Jimmie Rodgers imitator Frankie Marvin provides the vocals. If anyone out there could tell me which personnel is definitively correct, I’d be much appreciative. 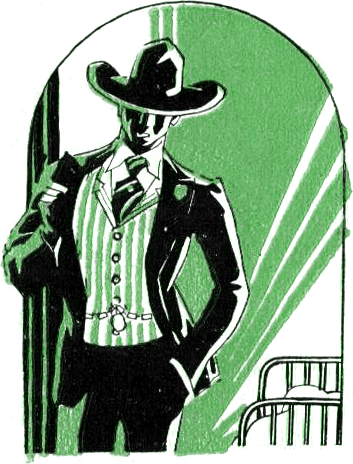 Of the first track, the Victor catalog says, “the ‘St. James Infirmary’ has created a sensation among dance enthusiasts. This record by King Oliver has capped the climax,” later continuing, “the song is taken from the old-time ‘Gambler’s Blues’.” Old time blues, they say, can’t say I have any complaints about that! While I couldn’t say for sure, many of the trumpet solos in this one do sound a lot like Bubber Miley’s style. 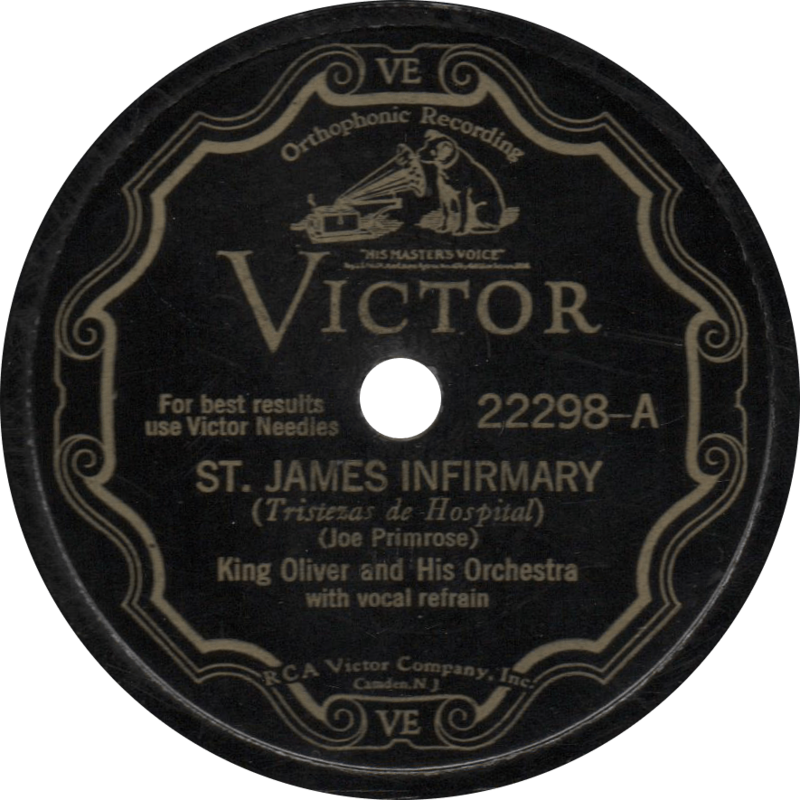 St. James Infirmary, recorded January 28, 1930 by King Oliver and his Orchestra. “King Oliver’s second number is a fox trot, ‘When You’re Smiling’. [This record] should be under your arm, carefully wrapped, the next time you come from a shopping excursion… And after that, you’ll have many moments in which to praise your buying instinct!” If you hadn’t guessed, that’s how Victor finished their marketing ploy for this record. Can’t say I really disagree with them, but thanks to Old Time Blues, you won’t have to wait ’till your next shopping trip in 1930 to hear it! When You’re Smiling (The Whole World Smiles With You), recorded January 28, 1930 by King Oliver and his Orchestra. This record, one I’ve been on the lookout for for quite a while, arrived just in time for Hoagy Carmichael’s 116th birthday, and I know of no better occasion to feature it here than that. Howard Hoagland Carmichael was born November 22, 1899 in Bloomington, Indiana. One of the most influential composers of the twentieth century, he is remembered for many enduring compositions including “Washboard Blues”, “Riverboat Shuffle”, “Star Dust”, “Rockin’ Chair”, “Georgia (On My Mind)”, “Lazy River”, and so many more. Carmichael graduated from the Indiana University School of Law in 1926, but after playing with a student band, he soon turned to music instead. Hoagy made his first recordings for the Indiana-based Gennett Records with Curtis Hitch’s Happy Harmonists in 1925. Over his long career, Carmichael became one of America’s foremost songwriters, and worked with such personalities as Paul Whiteman and Louis Armstrong, to name a few. Hoagy Carmichel died in 1981 at the age of 82. Victor 25494 is a 1936 master pressed reissue made up of sides originally from two different discs, recorded on May 21, 1930 and September 15, 1930 in New York. Both sides feature different, but equally star studded personnel in the band. Hoagy does the vocal on both sides, and both feature the cornet of Bix Beiderbecke, in two of his last recording sessions. 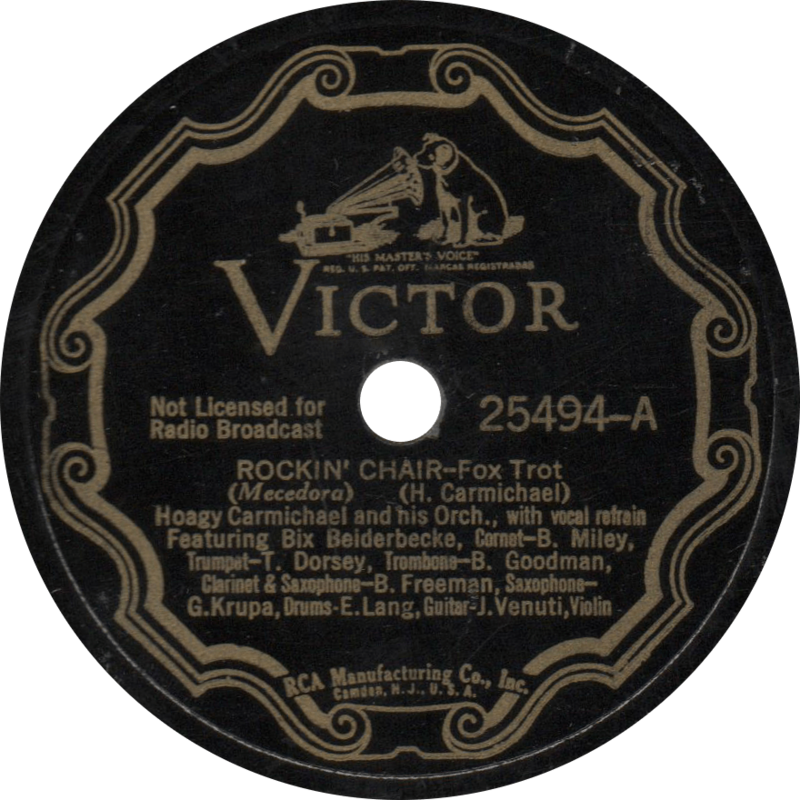 “Rockin’ Chair” was originally issued on Victor V-38139 and features the musical talent of Bix on cornet, plus Bubber Miley on trumpet, Tommy Dorsey on trombone, Benny Goodman on clarinet, Arnold Brilhart on alto sax, Bud Freeman on tenor sax, Joe Venuti on violin, Eddie Lang on guitar, Irving Brodsky on piano, Hoagy on organ, Harry Goodman on tuba, and Gene Krupa on drums. Rockin’ Chair, recorded May 21, 1930 by Hoagy Carmichael and his Orchestra. 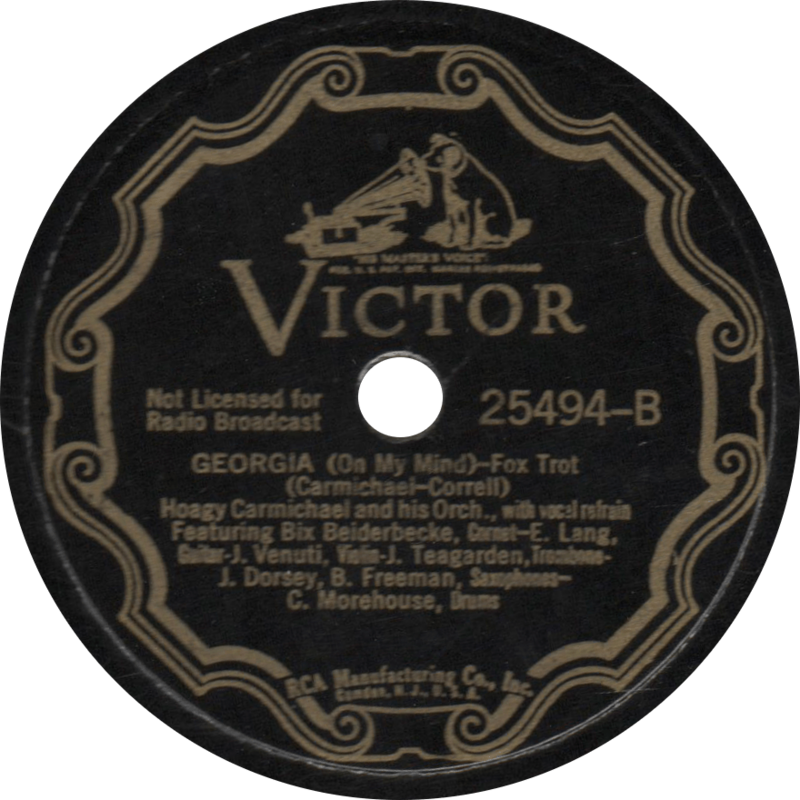 On the original recording of Carmichael’s famous “Georgia (On My Mind)”, originally issued on Victor 23013, the musicians present are Bix on cornet once again, with Ray Lodwig on trumpet, Jack Teagarden and Boyce Cullen on trombone, Pee Wee Russell on clarinet, Jimmy Dorsey on alto sax, Bud Freeman on tenor sax, Joe Venuti on violin, Eddie Lang on guitar, Irving Brodsky on piano, Min Leibrook on bass saxophone (though I honestly don’t hear a bass sax here), and Chauncey Morehouse on drums. This was Bix’s final recording session. Georgia (On My Mind), recorded September 15, 1930 by Hoagy Carmichael and his Orchestra. You see a spider goin’ up the wall. He’s goin’ up there to get his ashes hauled.